After nine innings, the Harbor Hawks and Whitecaps drew a tie on Friday evening. Hyannis started the scoring in the second on a single to center field from Trevor Hauver to score Tommy Jew. Brewster took the lead 2-1 in the third on a two-run single from Jesse Franklin. Hyannis then took back the lead in the sixth inning after Jew belted a two-run home run. Brewster scratched a run in the bottom half of the sixth to make it 3-3 on a Brandon Wulff RBI single. The seventh inning brought two runs, one for each team. Matthew Barefoot’s double to left field scored a run for the Hawks, and an Ike Freeman solo shot for Brewster tied the game 4-4, the ending result for the ball game. This game was suspended due to darkness, and also ended in a 4-4 tie. Chatham started the scoring in the middle innings, putting up two in the fifth. Drew Mendoza hit a solo shot for the Anglers. They scored on an error later in the inning to take the 2-0 lead. They scored two more runs in the seventh inning on a Michael Busch two-run homer. Y-D responded with all four of their runs in the game in the bottom of the seventh to tie the game. Nick Quintana started things off with a leadoff solo home run. Bradlee Beesley drove in a run with a single to cut the lead in half. Andrew Daschbach then doubled to right field that scored Beesley and Vito Friscia to tie things up 4-4. The game ended the next inning. Bourne jumped on Harwich in the first putting up two runs thanks to a couple RBI singles from Lyle Lin and Ashton Bardzell. 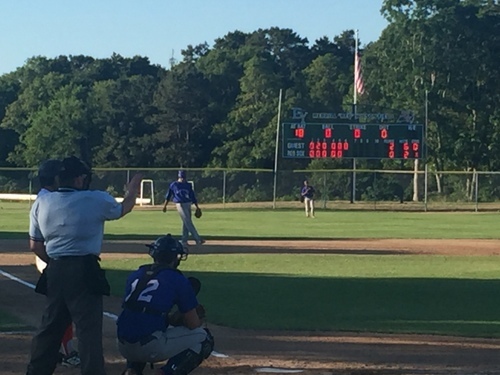 Neither team scored until the sixth inning when Harwich scored four runs to take a 4-2 lead. Aaron Schunk singled to score a run, followed up by another single that scored two runs off the bat of Andre Lipcius. Schunk scored later after a groundout from Logan Driscoll allowed him to cross the fourth run of the inning. The Braves tied the game up with two runs in the bottom of the sixth thank sto a David Langer RBI single and a groundout to the pitcher. Bourne broke the tie in the seventh with a Lin sacrifice fly. Harwich tied it back up with a Ben Norman single in the eighth. The Mariner’s offense came alive in the ninth scoring three runs including an RBI double from Norman to take the lead and eventually the ball game. The Gatemen shut down the Commodores on Friday night, surrendering just two hits and a run while their offense did their job to win the ball game. Wareham lead 3-0 going into the sixth inning thanks to two runs in the first inning on a Jeremy Ydens sacrifice fly and a Drew Milas single to center field. Isaac Collins scored in the third on a wild pitch. Falmouth scored their only run in the sixth inning on a leadoff solo home run from Edouard Julien. Wareham scored two more in the seventh after Collins singled. This gave the Gatemen some insurance and momentum to finish the game, winning 5-1. Orleans scored first in the second inning on a Carter Aldrete single to left field. Cotuit scored all six of their runs in back to back innings starting in the fifth. Brady Smith, Jonathan Robertson, Zachary Biermann, and Michael Toglia all singled in a run each to take a 5-1 lead. The Kettleers put up another two in the sixth on a couple more RBI singles from Peyton Burdick and Brady Smith, his second of the day. Orleans scored four runs in the ninth, rallying with a JJ Bleday two-run home run, a fielder’s choice that scored Spencer Steer, and an Aldrete double that scored one, but the rally came up short.